Home sharing, a practice started a few decades ago, is picking up steam in the post-recession economy, especially in high-cost pockets of the country, such as Morris County. All age groups are helped — from millennials looking for an affordable first pad to 96-year-olds who need to rent space in their homes for extra income, according to agencies that screen for the best candidates. But perhaps no group benefits more from home sharing, in a variety of forms, than the baby boomers. In a nutshell, the process involves agencies rigorously screening and matching home providers with home seekers who pay lower-than-market-rate rents set by the providers. “Most providers can’t afford their homes unless they take in a seeker, so they look to us,” said Lisa Blum, executive director of the Bridgewater-based HomeSharing Inc., the only agency in New Jersey to work full time at home sharing in multiple counties, including Morris. There are plenty of seekers, too, she said, adding there’s been a recent spike in the number of divorced people in their 60s. Many breakups leave one person homeless. “Each match is unique,” Blum said, adding that HomeSharing employs three social workers and is supported by multiple grants. One-third of its clients are home providers and two-thirds are home seekers. Neither are charged for the agency’s services. Since it opened in 1984, serving Somerset and Hunterdon counties, HomeSharing has made 1,600 matches. In 2011, it expanded to encompass Morris, Middlesex and Union counties. This year, it is growing yet again to include the Montclair area of Essex County. The expansions are meeting a need, according to Blum. Last year alone, the agency fielded 3,195 phone calls from people with affordable housing issues. In all counties it serves, HomeSharing made 185 matches involving 460 people in 2014. In Morris alone, it made 11 matches involving 25 people. “We’ve had rents as low as free, though we urge people to charge at least $50 a week, to $1,000 a month, depending on what the seeker is getting, how many people are coming into the house and where the house is located,” Blum said. In all cases, home seekers must at least have their own bedroom and be able to share the common areas of the home, including the bathroom, kitchen and living room. Last July, HomeSharing matched Jeanette Gargiulo, a 73-year-old Millington homeowner, with Anna, a 59-year-old home seeker. Both are widows who, together, have found a new and satisfying life. In Anna, however, Gargiulo found the perfect companion. Both women get up very early in the morning — Gargiulo to take care of her great-grandchildren, Anna to drive a school bus. By 9 a.m. each day, they’re usually both back home and ready for morning coffee, which, in certain seasons, includes watching the birds and wildlife. “Anna and I are companions for each other, but she also pays $650 a month in rent, which helps me with my bills,” Gargiulo said. “Otherwise, I couldn’t stay here. I have a big house — three bedrooms and 11/2 baths — and I have a mortgage, too, at my age. It’s expensive to live here. Agencies are noting that large life events, such as the death of a spouse, are throwing baby boomers into financial turmoil, particularly in tough economic times. Knoll Shared Housing, run under the auspices of the nonprofit Sparta Ecumenical Council, doesn’t match homeowners with home seekers. Its home sharing model runs differently: it accepts applications from people interested in sharing space in one of two, adjacent, five-bedroom homes, built six years ago for that purpose. Residents who qualify get state rental assistance, based on their income, and each pays a $245 monthly service that covers the cost of utilities, a housekeeper who cleans the common areas, a maintenance person and food on a grocery list to which each resident is urged to contribute. Reidinger said there are other rules: No pets are allowed, except to visit. Everyone must have a designated support person who serves as an emergency contact. For safety reasons, people sign in their visitors and sign themselves out when they leave the premises. Oliphant, 66, enjoyed a decades-long career as a guitarist until he suffered a stroke on April 22, 2010. But in the 20 years before that, he’d lived alone, happily, in his own Stillwater home. When the stroke forced him suddenly into an intensive rehabilitation and early retirement, everything changed. “The thing with a stroke is, you become so disoriented,” Oliphant explained. “I couldn’t move my left hand. I was in a wheelchair. I couldn’t walk. It was a train wreck. I’m talking on telephones, trying to organize a way to live. I couldn’t use my mouth. I couldn’t talk. I couldn’t swallow. Today, Oliphant calls the structure of life at Knoll Shared Housing “a godsend” for a stroke patient. He lives in beauty and cleanliness and has a private room and handicapped-accessible bathroom as well as use of the common areas. In the kitchen, he’s the master of the slow cooker. At Knoll, he said, life is as good as it gets. Still, living with four strangers isn’t always a bed of roses. There are adjustments to make. Knoll staff said some residents become the best of friends while others require mediation, which is provided, from time to time. Margaret Huyck, a longtime gerontologist in Chicago, another high-rent place where shared housing has caught on, said shared housing can solve problems for older adults. But challenges come with the terrain, she said. By the time people are in their 70s and 80s, Huyck explained, they have a distinct sense of how they want to live and how they want their space to be. “It’s not like you’re at college and shacking up with a roommate,” said Huyck, who said hoarding can be an issue. When adults homeshare, Huyck said, the ability to be mature, flexible and forgiving is key. 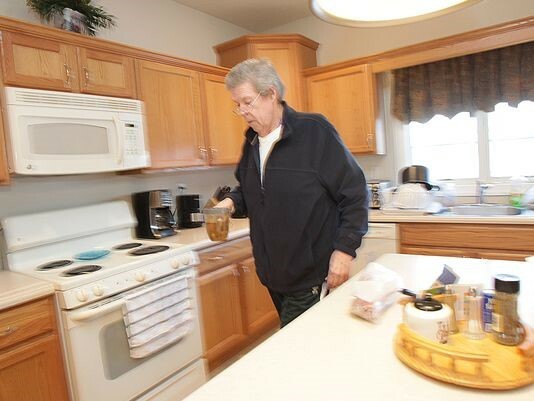 Service is a primary focus of HomeShare Vermont in South Burlington, Vermont, according to Kirby Dunn, its executive director. That’s one reason, she said, why the average monthly home share rent among the matches made by her agency is a low $208. “We have a cap of $400 a month, maximum rent, in our program, while the average rent of a one-bedroom apartment here approaches $1,200,” said Dunn, the only American speaker who will be featured at the Fourth World Homeshare Congress in Australia this fall. Vermont, where two agencies cover the northwest and central parts of the state, is known for its work in home sharing. As in New Jersey, HomeShare Vermont has seen an uptick in requests and matches since the Great Recession, according to Dunn. Both Blum, in New Jersey, and Dunn, in Vermont, say their agencies have flourished because they’re good at matchmaking and because they have multiple funding sources. But the movement hasn’t grown more, she added, because of lack of common standards and guidelines that would allow new agencies to replicate successful programs. Right now, each agency does its own thing. Some programs in the country rely on software, such as QuickMatch, to suggest home-sharing partners, as is the case with the free Home Sharing Program of the New York Foundation for Senior Citizens. There is an important future for shared housing, according to Dunn. That’s in part, she said, because baby boomers, a generation some 76 million strong, are more open to the idea of home sharing than past generations, which only shared living space with family.